Since 2005, ADAO’s annual conference has brought together more than 300 speakers ranging from experts, victims, and unions to lawmakers from 14 different countries to speak about our joint efforts in education, advocacy and awareness. Renaissance Arlington Capital View Hotel, 2800 South Potomac Ave, Arlington, VA, 22202. Note: In order to receive the reduced ADAO group room rate of $199.00 plus tax, reservations must be made by either online or by calling 1-877-212-5752. Other methods or Marriott numbers will not guarantee the group rate. There are limited number of discounted rooms available. 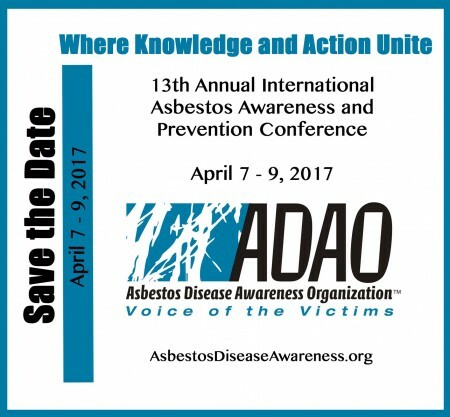 This entry was posted in Blog and tagged ADAO, asbestos, Asbestos Awareness Conference, Asbestos Disease Awareness Organization, mesothelioma. Bookmark the permalink.